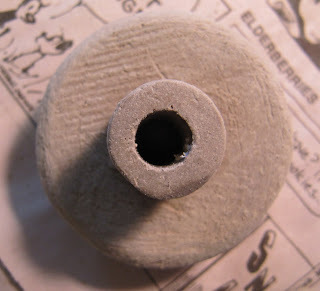 Here are the blank knobs that were thrown at the wheel last week, with a little bit of incising added. I will probably make most of my knobs from low fire clay, especially those I need for my kitchen that will match my tile work there. I am sure that some of the knobs will find their way into the salt kiln, however. These were thrown from my regular stoneware clay, but it really doesn’t matter since all of these will perish in the press-mold making process. Here is the freshly cast press mold, with 8 cavities for different knobs. The clay originals removed from the mold are scrap, and need to be dumped – not reclaimed – since they are contaminated with plaster scrapings. I will let the press mold dry for a day, and then clean it by vacuuming, and also by discarding the first knobs that might have plaster scraps in them. I have found that the easiest way to get a consistently sized knob is to extrude 1″ coil, and then cut it to specific lengths to get the size ball I want. I have also extruded 1/2″ coil to use for the knob shanks, and have carefully cut it to 1/2″ lengths. It’s firming up as I press the sized balls into the mold cavities. I am going to throw a little tool to press the ball into the mold and mark the center of the knob blank. My clay (Georgie’s Cannon Beach 10) joins to itself really well, so I just score the shank bit with a serrated rib and center it on the back of the blank knob. After the shaft is joined to the knob, I wait about 5 minutes and they can be lifted out with the shaft. Cool! Here’s a finished knob made from the first press mold. Since I have been just pressing sized balls into the mold, the deeper cavities of the first mold haven’t been a problem. I’ll probably touch it up a little bit with plastic steel wool or sandpaper, depending on what the surfaces are like coming out of the molding process. When the knob has dried a bit, I use a drill bit to make a hole in the center of the shank. I am going to experiment a bit with this – perhaps using one of those angled hole cutters that are used to make teapot holes. The 1/2″ shank bit would have to be dried to use a tool like that – we’ll see….. I have used a 5/16″ drill bit to make the holes… I think that should be big enough after shrinkage. Here’s the finished knob that Ted Juve gave me with his first instructions. You can see how the brass sleeve sits in the drilled hole. Ted says that it is very important that the knob be placed right side up after adhesive is placed in the hole, and the brass sleeve is inserted. That way, the sleeve will be flush with the bottom edge of the drilled hole, and will not vanish into the knob if the hole is deeper than the brass bit. I believe he suggested that the gluing be done on waxed paper – that will allow the paper to be peeled away leaving a tidy knob, and no knobs stuck to the worktable. The brass gizmos and their screws come from Aftosa. Such an interesting post — thanks for sharing. Can’t wait to see the finished product! I make ceramic knobs as well. I might try your method for creating the hole for the screw insert.